No one knows more about plumbing and heating products in this market than Thermco. Our staff has over 325 combined years of experience with plumbing and heating equipment sales and marketing. The lines we have chosen to represent are among the top tier in their respective product categories. We offer a broad range of products so that we are able to fill your needs for residential, commercial and industrial equipment. With a full line of plumbing fixtures for residential and commercial use, Thermco can provide you with products for a simple, one bedroom home or a magnificent luxury hi-rise. 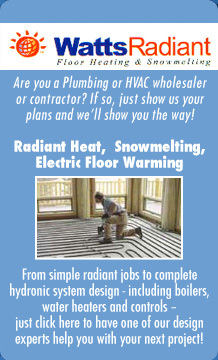 We have hydronic and radiant heat products for any and all applications. Residential, commercial and industrial boilers are our special area of expertise and range from 30,000 btu’s to millions of btu’s. They start with standard efficiencies and rise to the highest efficiencies in the industry. When you need heat, we can show you the way.